“Vague notions seem great until you work on the details. 1. Who did we interview/observe? 2. What did we learn about them? 3. What did we notice about/struck us as distinctive about the location/environment/neighborhood? 3. How can our trek findings serve as data points for salient patterns that might inform future persona profiles and scenario narratives? 1. 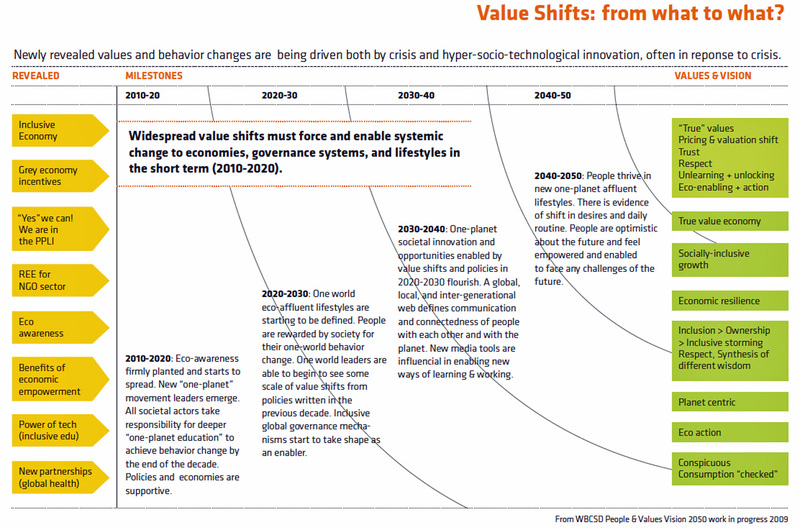 This roadmap, “Value Shifts: From What to What”, is a Collective Intention simplification of the WBCSD VISION2050 roadmap. It focuses on the value shifts that will have to take place beginning now in order to achieve the BENCHMARK GOALS of 2050. In the right hand column titled VALUES & VISION are the top level BENCHMARK GOALS in values to achieve by 2050. In the right hand column titled REVEALED are EARLY SIGNALS/FUTURE SIGNS we discern today that prefigure the necessary value shifts. In the center of the chart are the decade-by-decade big stages of the value shifts. This roadmap could be improved most obviously by making it a dynamic, interactive build or reveal. How else would you better convey content like this? (Remember that the content here relates to VALUE SHIFTS in the FOCUS FIELD of SUSTAINABLE PRODUCTION & CONSUMPTION. You will have to adapt it to your own LIFE2050LAB’s FOCUS FIELD (LEARN, SHARE, OPPORTUNITY). 2. 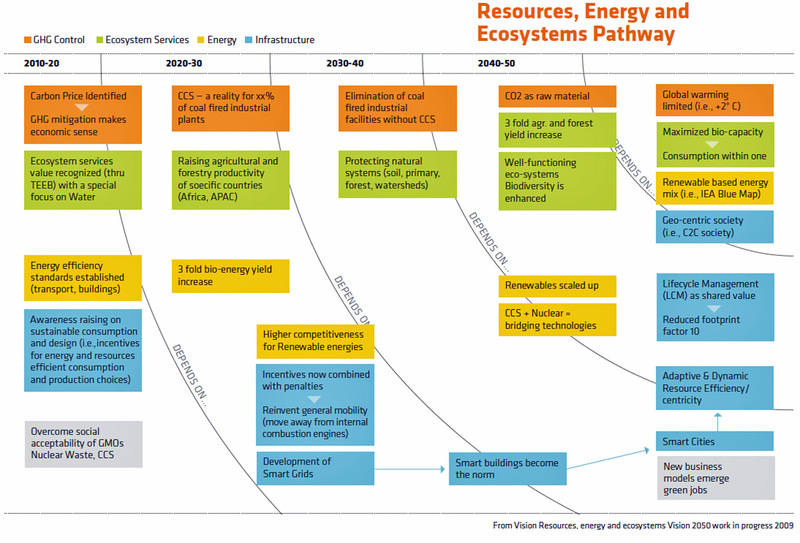 Here is another roadmap, “Resources, Energy & Ecosystems Pathway,” that simplifies the WBCSD VISION2050 roadmap with different content. In this one, the desired end-states or BENCHMARK GOALS are in the right hand column in the 2040-50 decade sector. From there we back-cast each pathway to the milestones that each preceding decade by decade sector has to hit in order to achieve the 2050 goals. The arcs separating decade sectors are labeled “DEPENDS ON” which means that achieving each milestone depends on the milestone before it – and the one before that – and so on. (Remember that the content here relates to RESOURCES, ENERGY & ECOSYSTEMS. You will have to adapt it to your own LIFE2050LAB’s FOCUS FIELD (LEARN, SHARE, OPPORTUNITY). 3. This template, “Personas Views of the Future,” is based on segmenting the personas according to categories of differential values, attitudes and likely adoption behaviors. 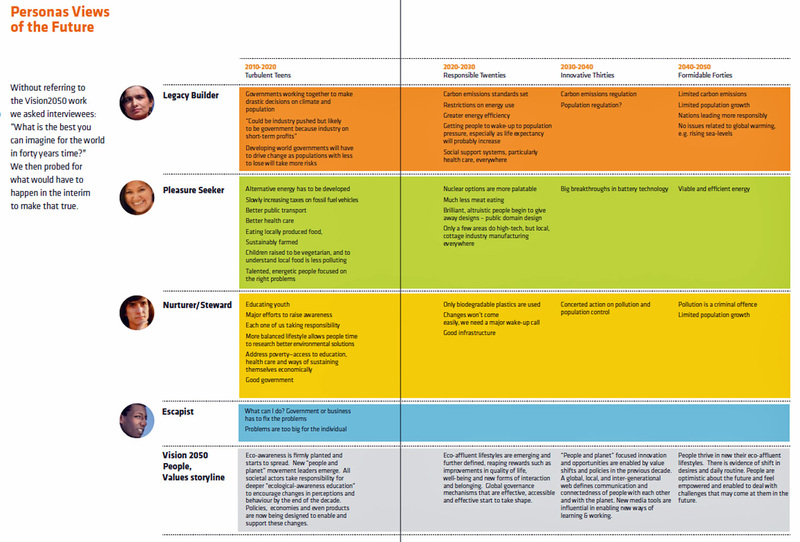 The bottom row titled “Vision 2050 People Values Storyline” is taken from template 1 above, “Value Shifts: From What to What,” in order to compare a normative progression of decade milestones with how different people might view that progression differentially. 4. These templates are taken from the Collective Invention Workbook, “Sustainable Lifestyles 2050,” which I introduced to you on Day 1, Assignment 1. This workbook contains a number of other templates that you might find helpful as you explore ways to structure and represent the relationships between your present day Exploratory Trek Interviewees and your Future Scenario Personas. This material my have more meaning for you now at this stage of your team project. I strongly recommend you scan through this workbook again. OF COURSE DO NOT FORGET THE KEY REFERENCE TEMPLATES: – GREEN DENMARK scenarios 2050 GREEN DENMARK SCENARIOS – ALL THE PGH & METROREGION FRAMEWORKS & TEMPLATES FROM DAY 3 AND DAY 4.